Summary: After trained examiners and accomplished business professionals performed a thorough assessment of this work, Ben Hartman has been selected as recipient of an internationally recognized award from the Shingo Institute, part of the Jon M. Huntsman School of Business. The author will receive the award at the 28th International Shingo Conference occurring April 25-29, 2016 in Washington DC. LOGAN, Utah — The Shingo Institute, part of the Jon M. Huntsman School of Business at Utah State University, has awarded Ben Hartman with the Shingo Research and Professional Publication Award for his book, “The Lean Farm: How to Minimize Waste, Increase Efficiency, and Maximize Value and Profits with Less Work.” Hartman and his wife, Rachel Hershberger, own and operate Clay Bottom Farm in Goshen, Indiana, where they make their living growing and selling specialty crops on less than an acre. "Receipt of the Shingo Research and Professional Publication Award signifies an author's significant contribution to advancing the body of knowledge regarding enterprise excellence,” said Ken Snyder, executive director of the Shingo Institute. To many people today, using the words “factory” and “farm” in the same sentence is nothing short of sacrilege. In many cases, though, the same sound business practices apply whether you are producing cars or carrots. Hartman and other young farmers are increasingly finding that incorporating the best new ideas from business into their farming can drastically cut their wastes and increase their profits, making their farms more environmentally and economically sustainable. By explaining the lean system for identifying and eliminating waste and introducing efficiency in every aspect of the farm operation, “The Lean Farm” makes the case that small-scale farming can be an attractive career option for young people who are interested in growing food for their community. Working smarter, not harder, also prevents the kind of burnout that start-up farmers often encounter in the face of long, hard, backbreaking labor. Using examples from his own family’s one-acre community-supported farm in Indiana, Hartman clearly instructs other small farmers in how to incorporate lean practices in each step of their production chain, from starting a farm and harvesting crops to training employees and selling goods. 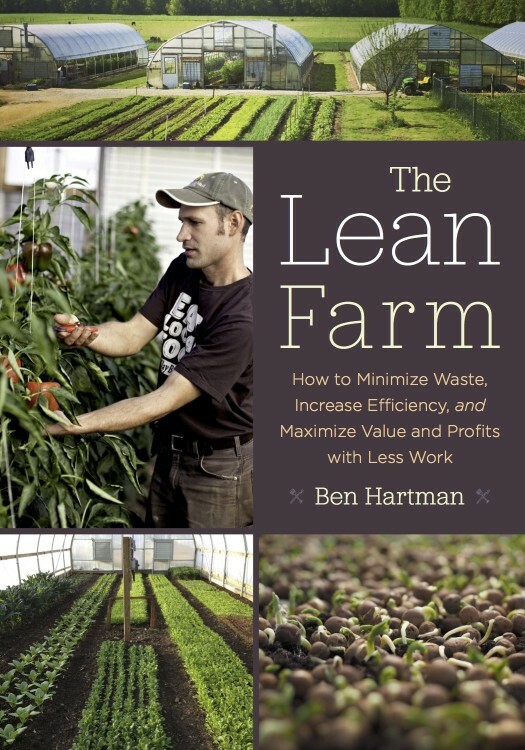 While the intended audience for this book is small-scale farmers who are part of the growing local food movement, Hartman’s prescriptions for high-value, low-cost production apply to farms and businesses of almost any size or scale that hope to harness the power of lean in their production processes. Hartman will receive the award during the Awards Gala of the 28th International Shingo Conference in Washington D.C. The conference is a five-day event featuring a selection of workshops, plant tours, keynote speakers and breakout sessions designed to provide ongoing knowledge, insights and experience for organizations in pursuit of operational excellence.